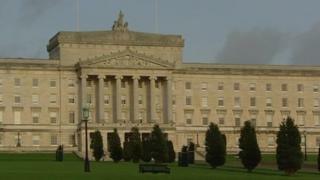 Politics over the summer has been dominated by increasingly tetchy rows over Stormont's budget and the impact of delaying welfare reform. The executive's broad spending policies were set out in a four-year budget agreed in 2011. That was against a backdrop of a tough UK spending review. This meant Stormont would have to save £4bn in real terms over the budget period. Focusing on the the current budget - that is the day-to-day expenditure incurred in the running of public services- it faced a real terms eight per cent cut over the four years. That budget actually increased in cash terms over the four years, but when adjusted for inflation it is a real terms fall. It is a much smaller cut than those experienced by many Whitehall departments or English local authorities. The eight per cent also does not apply across the board. Health is largely protected, which means the other departments have had to find savings of more than eight per cent. Over time those savings become harder to achieve. There is a cumulative impact, there are fewer easy savings to find, and there is less and less room for manoeuvre. And because we are now in the fourth year of making savings things are clearly getting more difficult. Indeed, the emergency two per cent cuts to all departments, apart from health and education, which were announced in July were not primarily about welfare reform as some people may believe. Finance Minister Simon Hamilton referred to "a range of factors" and added that we are now at the point of "a radical change in the public expenditure environment that I have been warning about for some time". There is another budget reallocation due in October, when the welfare reform "fines" are due to take effect. Those fines reflect how much the benefits budget in Northern Ireland should have fallen by if welfare reforms had been enacted. As that has not happened the Treasury is instead extracting the equivalent sum from the day-to-day public services budget. That will mean another £87m of cuts from day-to-day budgets. Then there is the small matter of the executive having to agree a comprehensive one-year budget for 2015/16. The most recent Treasury projections suggest that further cuts of at least 1.5% will have to be found. On top of that is the 2015/16 welfare reform "fine" of £114m. Stormont's spending environment is ultimately determined by the UK Treasury - 95% of the devolved administration's budget is the block grant awarded by Westminster. That environment is not likely to become much more benign in the next few years. Westminster's coalition government has committed to eliminating the deficit - the difference between what the government collects in taxes and what it spends on services. That is largely being done through what we have come to call austerity, which is about tax rises and to a much, much greater degree, spending cuts. Austerity still has a long way to run - the independent Office for Budget Responsibility forecasts cuts of five per cent in day-to-day spending at a UK level in both 2016 and 2017, and a further three per cent cut in 2018. There will be a knock-on effect to Stormont departments via the devolved nations spending formula. For technical reasons the saving will not have to be as big in Northern Ireland, but the general direction of travel is the same - less money, more cuts over the next four years. Some people may be hoping that if Labour wins the next election austerity will be ended. However, the shadow chancellor, Ed Balls, made what he called "a binding commitment" earlier this year that a Labour government will eliminate the deficit as soon as possible in the next parliament. He said the speed of that will depend on the state of the economy and public finances. His commitment to deficit reduction was a bit looser than that given by the current chancellor, but he was certainly not promising to end austerity.